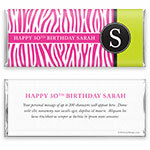 Bold zebra stripes and vibrant color combine to create a perfect birthday candy wrapper. 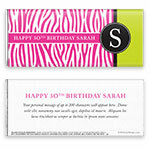 Design: Pink zebra striped background with black initial monogram and lime green accent. Personalization: Front greeting, name and initial, back title and message.